Mangoes are still in season and I’m having a great time converting them into delicious desserts! Mango is a great tropical fruit and works well to turn out exceptional desserts. 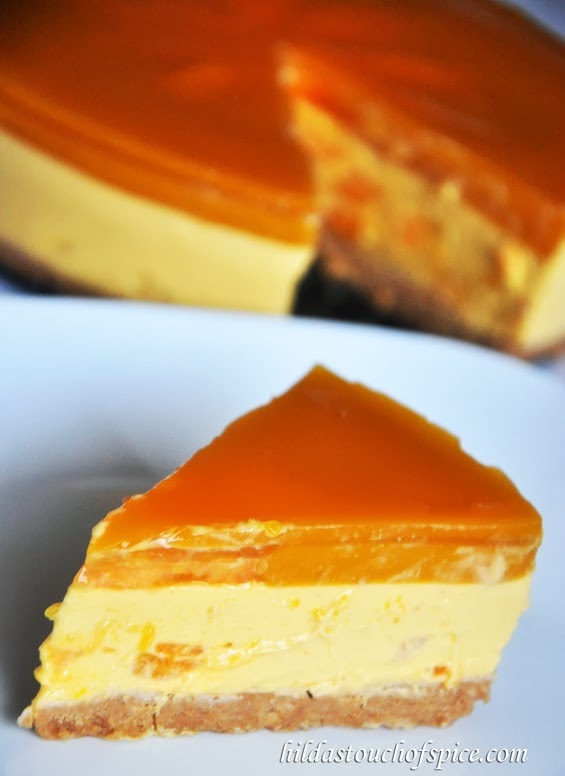 Today’s recipe is the most irresistible mango cheesecake. I used freshly cubed and pureed sweet, ripe Dasseri mangoes to make this light and refreshing cheesecake. I also used homemade cream cheese. The cheesecake had the perfect texture and softness. When I opened the springform pan, the mango cheesecake looked ah-ma-zing!! The sliced wedges displayed the mango cubes embedded in the cheesecake. It looked so pretty and just melted in the mouth. I also assembled the cheesecake in a few glasses which looked so cute with mango hearts! 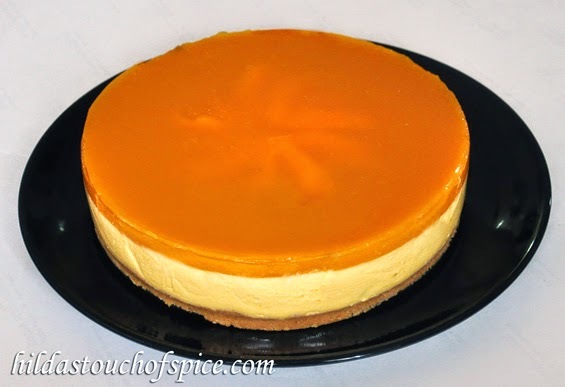 This Mango Cheesecake is dedicated to my friend Maria Rose from Jaipur, Rajasthan. Hope you enjoy this recipe. Here’s how you go about preparing and assembling the Mango Cheesecake..
Crush the biscuits in a sealed zip loc bag with a rolling pin to a fine powder. Pour out the contents in a sufficiently large bowl and blend in the butter to combine. If using a food processor, add the butter and blend to combine. Pour out the contents in a cake tin/springform pan or glass bowl. Press firmly and evenly on the base of the tin & chill or freeze till the base is firm. Dissolve gelatin in boiling water. Stir to cool. 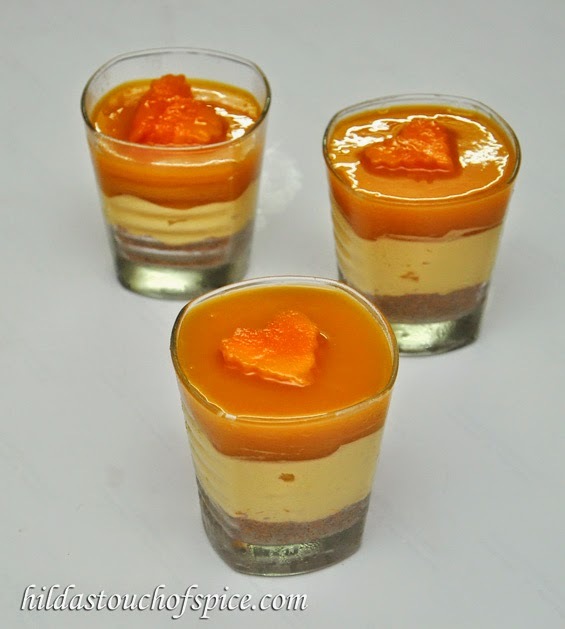 Blend gelatin in the mango puree. Beat sugar and cream cheese until light, smooth and creamy. Add the mango gelatin mixture to the cream cheese mixture and combine well. Whip the cream until stiff, fold in the whipped cream and stir in the mango pieces/cubes. Pour this mixture over the chilled crust and smoothen the top. Chill for at least an hour or until set. Dissolve gelatin in boiling water. Cool slightly. Combine mango puree, sugar (if using), lime juice. Add the gelatin and mix thoroughly. Pour half the mango glaze on the chilled cheesecake and smoothen evenly. Chill again until set. Arrange mango slices and pour the remaining mango glaze. Smoothen again. Chill to set. Bring to room temperature for about 10-15 mins. Serve the mango cheesecake sliced into wedges.